Headline inflation came in at 3.4% year on year in July, posting another 0.3ppt acceleration compared to the previous month. The fact that the number remains above the 3% target for the second month was a mild upside surprise, but as it matches the National Bank of Hungary's latest forecast, we hardly see any move by the central bank. 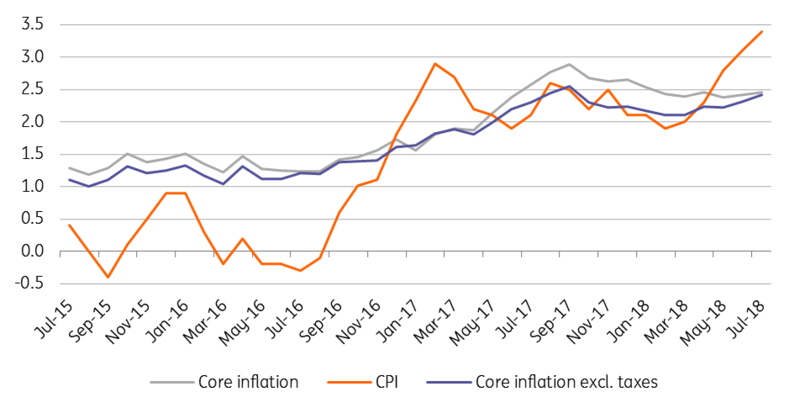 Moreover, as core inflation remains below target at 2.5% YoY and the Hungarian forint is stable around 320, it gives the central bank some breathing room to look past the accelerating inflation. As we previously expected, the main driver of the headline increase was the 17.8% YoY growth in fuel prices. This itself explains the 0.2ppt, thus two-thirds of the acceleration in the July reading. Besides this, prices of consumer durable goods increased by 1.0% on a monthly basis, the third highest growth all time after April and July 2009 reading at 1.4% and 2.4% MoM, respectively. The common denominator in these outlier readings is the moves in EUR/HUF. The HUF weakened 17% YoY both in April and July in 2009, while this time a 6% YoY weakening after three years of continuous stability was enough to move the needle. 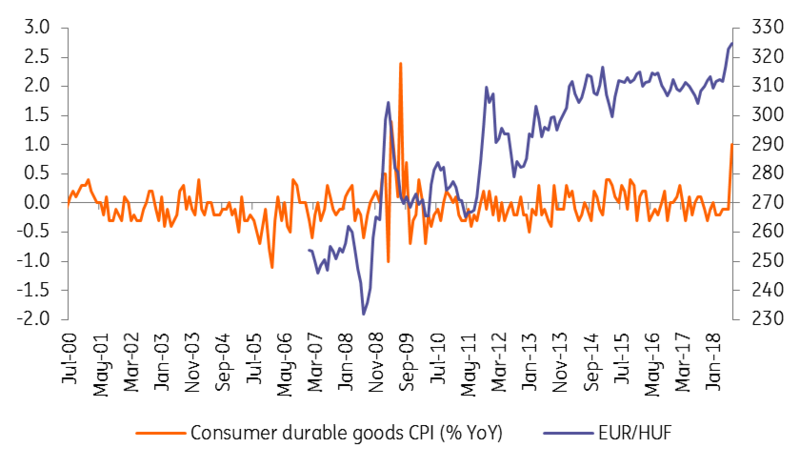 The main element responsible for higher prices of durables is that the price of new cars jumped 6.2% YoY, so importers reacted immediately to the weak forint, as it happened back in 2009 too. 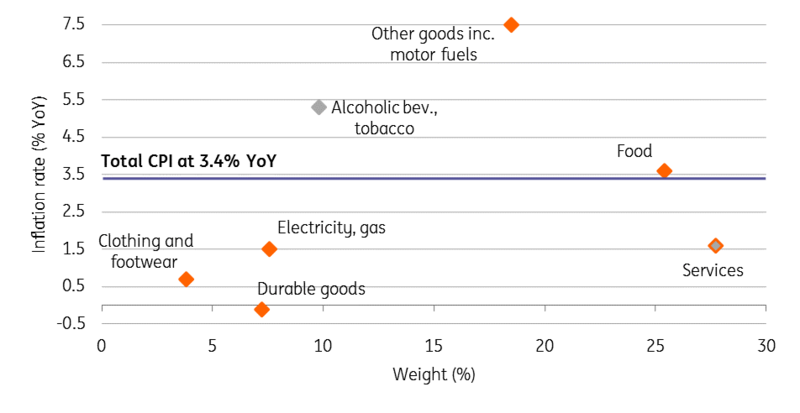 The year on year price change in durables was also remarkable as it came in at -0.1% YoY compared to -1.1% YoY in June. This acceleration is responsible for a 0.1ppt uptick in the YoY headline CPI. Opposite to European tendencies, food inflation accelerated to 3.6% YoY. Regarding the services, inflationary pressures aren't still a source of worry at all, as the inflation of services remained flat in July, showing a 1.6% YoY increase. In the coming months, we expect inflation to moderate, mainly because of the base effect coming from the oil prices, although CPI could still remain above the central bank's 3% target. When it comes to the average of 2018, we forecast a 2.8% YoY increase in prices.